Cuts free with the Sword of Kali the children of God who are entrapped by humanly created entities of the sinister force. 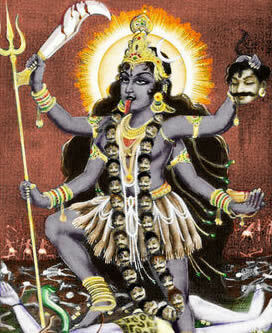 Kali's Name means "black" and is also derived from the Hindu word for "time". She has also sometimes been identified with Durga. Her very appearance is meant to terrify the entities, demons, and devils of the sinister force and the "dweller on the threshold". She has at times been depicted as black and wearing a necklace of skulls or severed heads representing slain human egos that have sought to usurp the Divine Mind. Kali is not always thought of as dark, but also as a loving mother, and is revered by millions of Hindus especially in that aspect. "Let the fierceness of Kali rage until the darkness of Death and Hell in Earth is consumed by the White Fire of the Divine Mother in each and every chela of the Will of God! 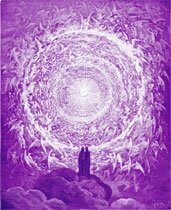 "I AM THAT I AM in the Fiery Vortex of the I AM Presence. So I AM the Shekinah and the Divine Mother. And I have come for the liberation of the Light and the Lightbearer! "Therefore, beloved who embrace Me, embrace now the living Sacred Fire. Embrace, then, my true son, my true daughter. Therefore, let the allegiance to the Banner of Maitreya, to the Banner of the Divine Mother be pure and swift as an arrow. . . . "
" . . . Blessed ones, you must march forward. Thus, you have sung the song to the Sun that is sung by pilgrims marching to the Sun away from dead and dying worlds. This is the true march and the singing as they face the Light and never look back but march on on that Cosmic Highway. "And therefore, these ones, having, as it were, Ribbons of Light flowing behind them as attachment to the etheric spheres of their home stars, become as those who take the best and leave the rest and thus take home the harvest in their Spheres [Causal Bodies] of Light and let the rest wait for the dissolution of worlds. "Understand, beloved, that that which can be harvested must be harvested. So the crops do not wait in the fields lest the rain come and spoil them. Thus, understand that there are worlds to be harvested, worlds of Light and good and great consciousness. "So come the Reapers! And when they harvest the good fruit, lo, the tares are left and then other reapers come and harvest these and bind them in bundles to be cast into the Lake of Sacred Fire. 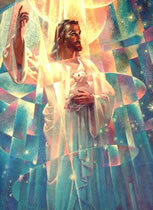 "Blessed hearts, you see, when you stand ready to be plucked by the Angels of Light for victorious service midst the Legions of Light, you understand that because you have prepared yourself to the harvest, both as the bountiful offering of the Divine Mother and as harvesters yourselves, you are clearing the field of all that is of worth and allowing the remains to stand alone, their tatters blowing in the wind as some scarecrow left over in mid-October. "Realize this, beloved. Let the Light be harvested that the evil may be bound. Therefore, tarry not in the cups of the evil doer. "Look up, beloved, for nigh unto you is that mighty Sphere of Light, a bower of loveliness: I AM THAT I AM in the fiery center of the Great Causal Body of the Divine Mother appearing! "So I AM THAT I AM THAT I AM. So I AM a devouring Flame as the Light goes forth out of My Mouth. And it is Fire, beloved. It is living Fire. So may it proceed from Me lest you yourselves find your tongues singed. 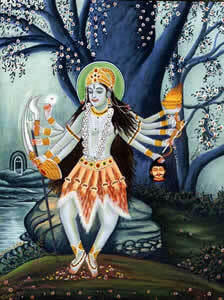 "Therefore, when you make the call, I, Kali, shall release that Sacred Fire into the core of evil. Let the call go forth! For I AM here and I have had enough. And I say, enough is enough! "So behold, the day of the Legions of Kali has come! The day of the Legions of Kali has come, beloved. And this is not the dark night of the Kali Yuga, save for the dark ones. It is the Light Day of the Great Kali come, beloved! And it is the Day of the Appearing of the Divine Mother! "So I AM here! And see how this Light, as lightning itself, does illumine the sky with a Light no man can gaze upon. It is the 'Light Kali Yuga'. And behold, Mine own in the earth shall truly embody the Crystal Fire Mist. And the Mist shall crystallize. And we shall see where the seed of the wicked are left." "I AM the Annihilator of all and anything that is not worthy of keeping."